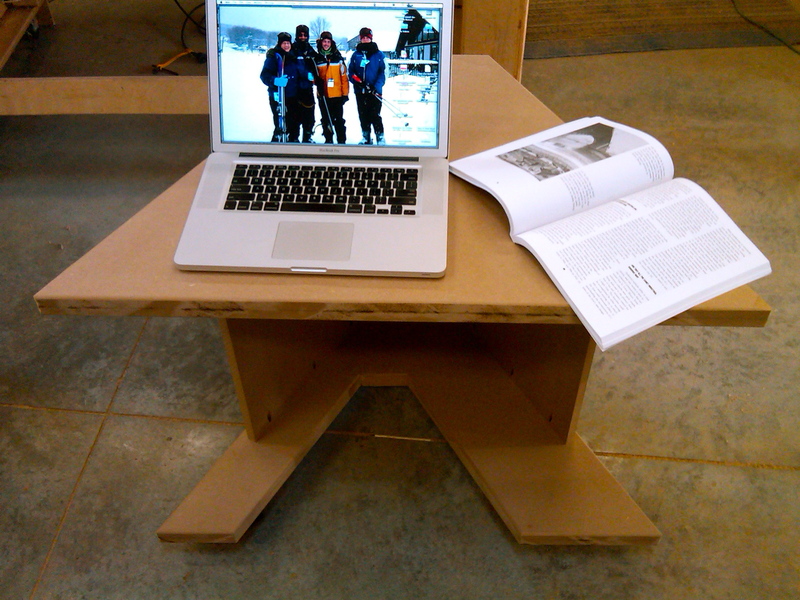 Finding an affordable, durable, flexible rolling computer desk for public computing centers can be a real challenge. My solution was to build this trapezoidal desk. The top is 38″ across the front to easily hold a keyboard, mouse, book, and 20″ monitor, while the space underneath is wide enough to securely hold a tower computer. Multiple desks can be built and put together in a range of flexible arrangements for individual and group work. Roll it over to a table when more workspace is needed, or link several together side-by-side to form a collaboration circle. 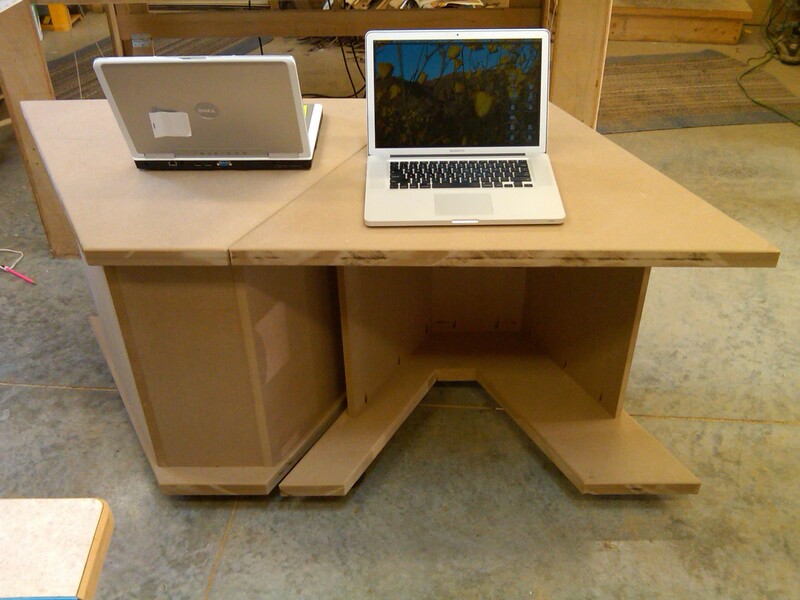 Each desk is made out of a single 4×8′ sheet of 3/4″ Medium Density Fiberboard (MDF) and three castors, and is assembled using pocket screws. I spent around $40. For those unfamiliar with MDF, it is a highly stable, strong material that takes paint very well (although it must be primed with a solvent-based primer first and end-grains should be sealed using something like joint compound for a very smooth finish). It also serves well as an underlayment for laminates. 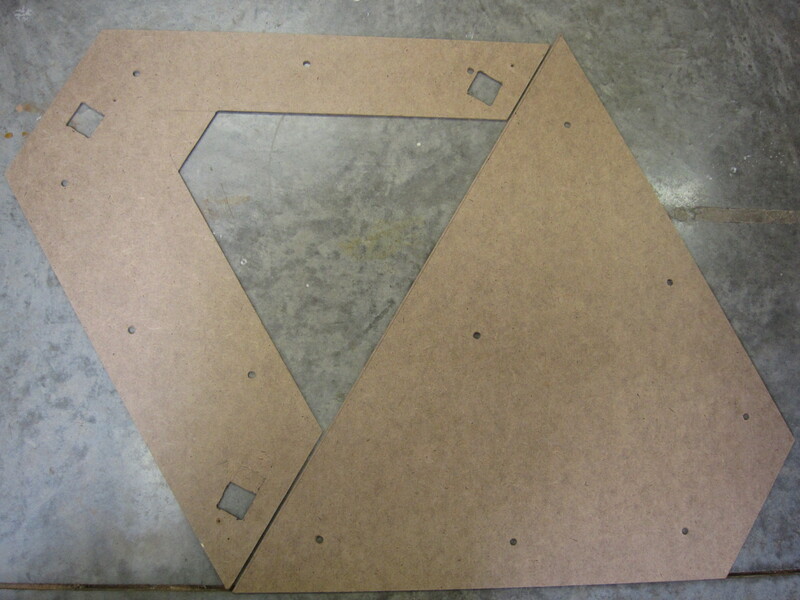 Set the table saw blade to cut a 30 degree angle and rip a 15 3/4″ by 97″ strip from the MDF board and set aside to be used later to build the leg section. 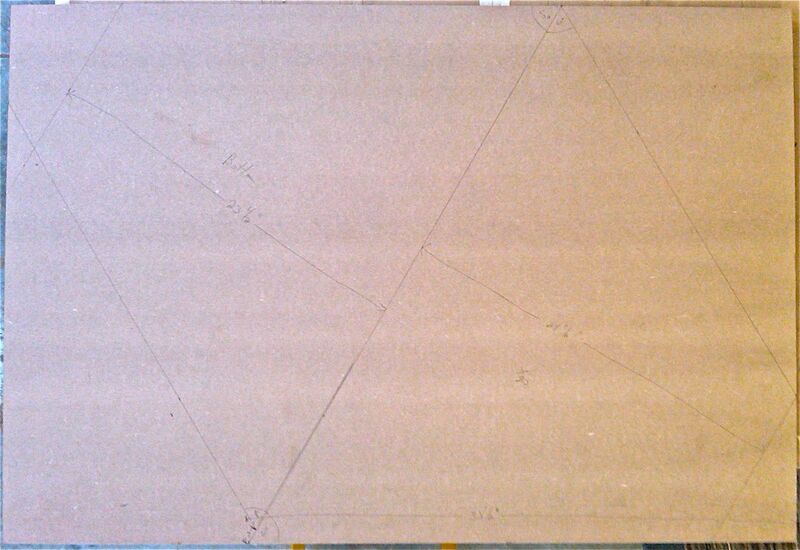 Lay out the top and bottom sections on one of the 33 5/8″ x 48 1/2″ boards to prepare for cutting. This will assure that screws will be located in “safe zones” after gluing the two boards together. The finished markup should look like the picture at the right (click for a larger view). NOTE: To simplify making a large number of desks, this step could be done once on 1/4″ hardboard, cut out, and used as a template to quickly locate screw placements on all future desks. 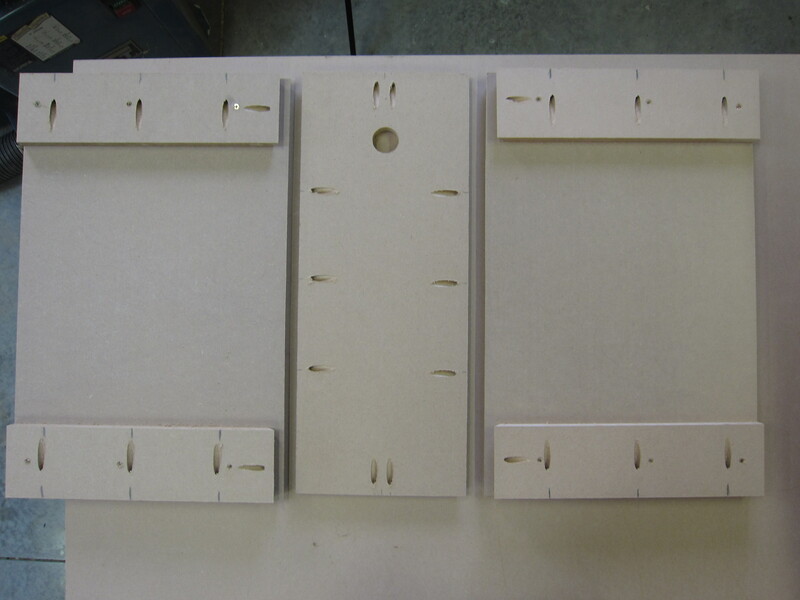 Jigs of 1/4″ hardboard used to layout top and bottom. 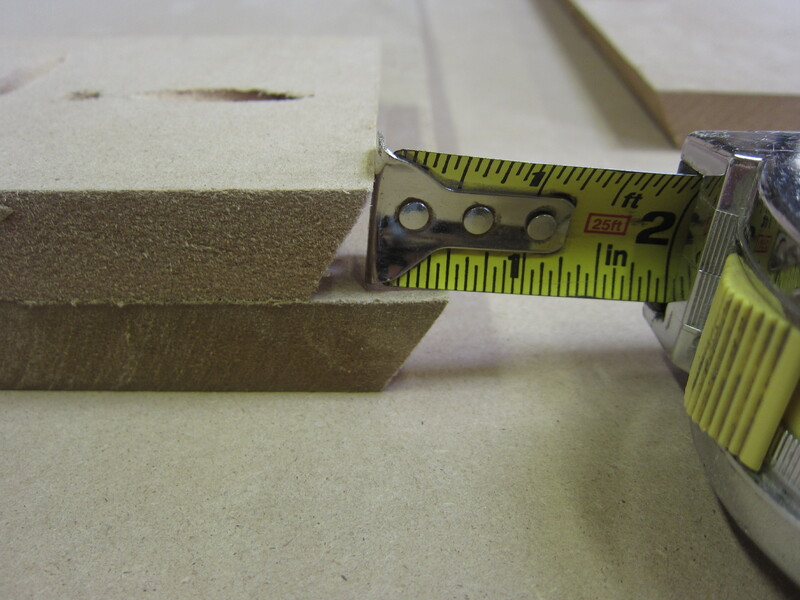 Measure 33 1/2″ along the long edge of the board and make a mark. This will be one side of the top. Measure a 60° angle and draw a line to begin creating an equilateral triangle. This will be the front of the top. Measure a second 60° angle to complete the equilateral triangle (although the tail of the triangle will not be completed since this will be a trapezoid). This will be the second side of the top. To complete the trapezoidal shape, mark a line 24 1/2″ back and parallel to the front of the top to create the back of the top. Make a line parallel to and 1/8″ away from the top front line to create the front of the bottom section. Measure 1″ from the edge of this line (the bottom will be 1/2″ smaller on each side to allow the tops to always abut cleanly when the desk is finished). Create a 60° line from the mark just made to create one side of the bottom. To complete the trapezoidal shape of the bottom, mark a line 23 1/2″ back and parallel to the front of the bottom section to create the back of the bottom. Glue the two 33 5/8″ x 48 1/2″ boards together by evenly spreading a liberal amount of wood glue onto the non-marked board and putting the marked board on top. “Clamp” the two pieces together by placing 1 1/4″ general construction screws into the marked side of the top board within the top and bottom sections drawn in the step above. Cut 3 – 23 1/2″ pieces from the 15 3/4″ x 97″ strip cut above. 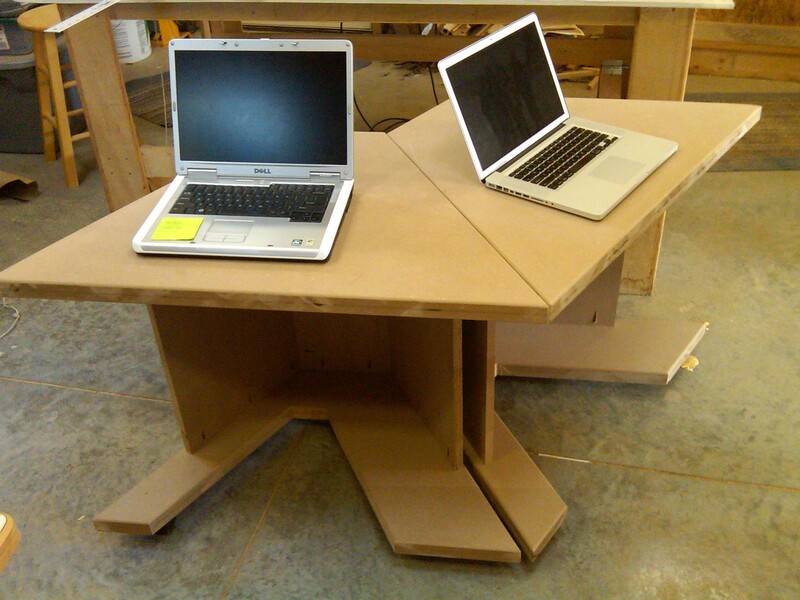 This will create a desk 29″ tall when using 2″ plate casters. Adjust length of pieces for a taller or shorter desk. Cut 4 pieces 4″ wide each from the remaining 15 3/4″ wide original piece. These will be used as additional bracing for the two side boards. Set the blade to 30° and rip one of the 23 1/2″ piece to 9 1/2″ wide to form the trapezoid that will be used as the back of the leg section. With pocket jig set for 3/4″ drill 6 pocket holes evenly spaced along the sides on the wider side of the back piece and 2 holes evenly spaced along the top and bottom of the same side of the back piece. With the point towards the top, use the pocket jig to drill one hole at the tapered end of each of the 4″ pieces. Attach the 4″ pieces to the top and bottom of each side piece. The tapers should align with each other, with the 4″ piece set 1/2″ back from the side piece (I built a jig to help assure accurate spacing each time). Secure the 4″ pieces to the sides using (3) 1 1/4″ construction screws for each. Rip the sides to 15 1/2″ to remove any excess for the 4″ pieces. Set the pocket jig for 1 1/2″ stock and drill three evenly spaced holes into each of the 4″ pieces. Following the lines drawn in the first step, cut apart the top and bottom pieces. 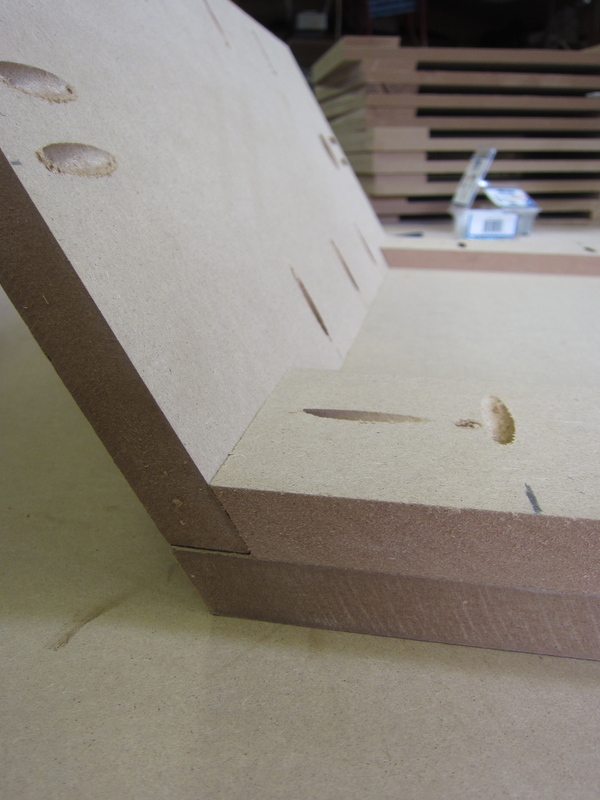 Set the rip fence to 24 1/2″ and cut the back of the top piece so that it is parallel with the front of the board. 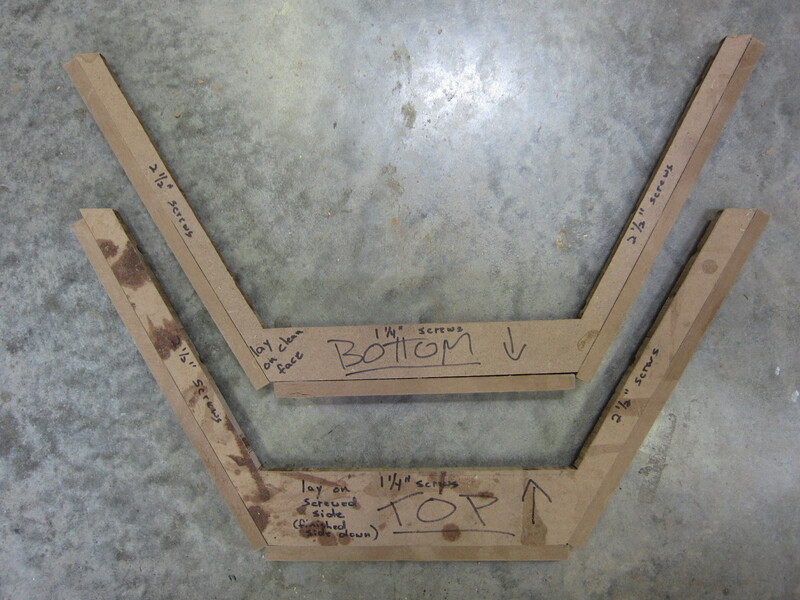 Set the rip fence to 23 1/2″ and cut the back of the bottom piece so that it is parallel with the front of the board. Use the table saw to cut slots 9″ from one side of the bottom piece and 5″ from the other side. The slots will end up 17″ long, but use a jig saw, bandsaw, or hand saw to complete the last part of the cut. Use a jig saw to cut a line 14 7/8″ back from and parallel to the front of the bottom piece to connect the two slots. Unless the top and bottom will have laminate applied, use a 1/4″ roundover bit along all edges of the top and bottom of the top piece, and along the top of the bottom piece. Assemble the leg assembly using 1″ pocket screws (as opposed to the normal 1 1/4″ pocket screws used with 3/4″ stock). Begin by fitting the back into one side piece. 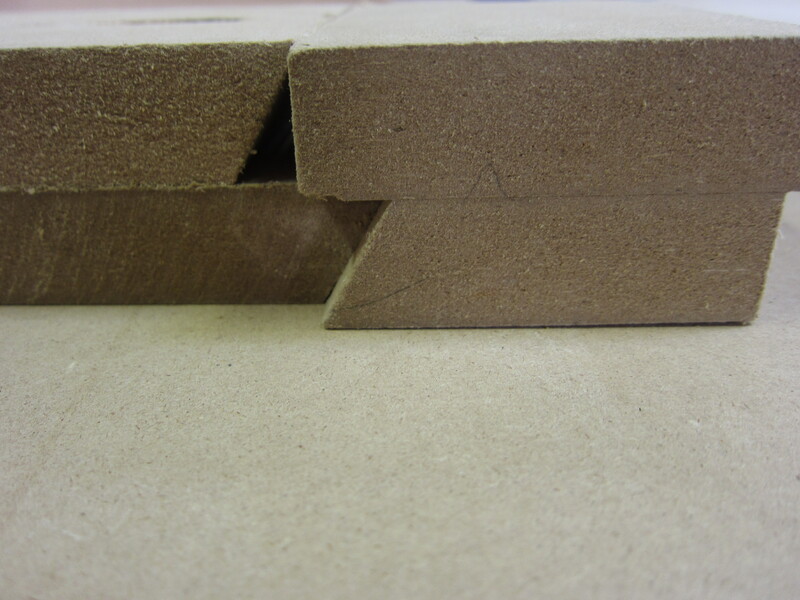 The taper of the 4″ support board should be flush with the face of the back piece, while the taper of the back piece should be flush with the side. Make sure the bottom of the back and the bottom of the side are precisely even. Attach the top 4″ piece to the back. Repeat for the bottom 4″ piece. Fit the second side piece onto the back and attach each of the 4″ pieces. Finish the leg assembly by screwing the back into the side using the 6 pre-drilled holes. Position the leg section 2″ from the back of the bottom piece and 15/16″ from sides(To assure accuracy across multiple desks, jigs can be created to help with alignment). Attach with 1 1/4″ pocket screws into the back section, and 3″ pocket screws into the sides. Position the leg section 2 1/2″ from the back of the top piece and 1 1/8″ from sides. Attach with 1 1/4″ pocket screws into the back section, and 3″ pocket screws into the sides. Attach 2″ plate casters to the bottom piece using 1 1/4″ general contractor screws. Casters should be located 3 1/2″ from the front and back edges. Center the back caster. Locate the front casters 2″ from each side. Prime with an oil-based primer since MDF is susceptible to dimpling wherever water falls on its surface. The topcoat can be either oil- or latex-based.